Menus printed by FLYERSDIRECT.com are an attractive and vibrant extension of your product or brand. Our menus have been tested locally in our extreme Arizona conditions (misted patios, 100 + degree summer weather, dust storms, monsoons, etc). 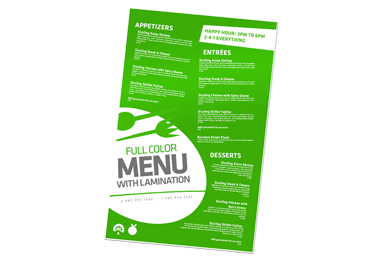 Our menus are printed full color two sides on a sturdy 10pt c2s cover stock, then they are laminated and encapsulated in a gloss 5mil laminate. The finish products total thickness is 20pt. These are great for all food and beverage service industry businesses, on Patios or by pools. The encapsulated product is safe from the elements and estimated to last 5 months. The rule of thumb for laminated products is one month per mil of lamination (ie) 5mil 5 months under normal conditions. Our menus also make great countertop POS advertisements, employee scripting cheat sheets, sizing charts, etc. Our menus feature and impressive 187 square inches of printable real estate per side, that’s a total of 374 square inches of products, advertising or branding. First create a new document and set it to the canvas size listed above. Your bleed area is 1/8th” from the edges. Come in 1/8″ from your canvas size. Keep all type within safe area.